Ida Asnoudj is a primary school teacher. She left France after Marine Le Pen’s bill prohibiting the wearing of religious symbols was passed. After moving to Quebec, Asnoudj might have to jump the same hurdles if the provincial government’s secularism bill passes. Asnoudj was one of the thousands of people who took to the streets this Sunday to protest the proposed bill. While the crowd marched down René-Levesque Blvd. it was difficult to see where the sea of protesters started and ended. The march, which started at Place Émilie-Gamelin and ended at the John A. Macdonald statue–which has been defaced repeatedly over its racist connotations–remained peaceful. Premier François Legault, and the Coalition Avenir Québec, have been met with opposition since proposing Bill 21, which prohibits workers in the public sector with authority, notably police, judges, and teachers, from wearing religious symbols. 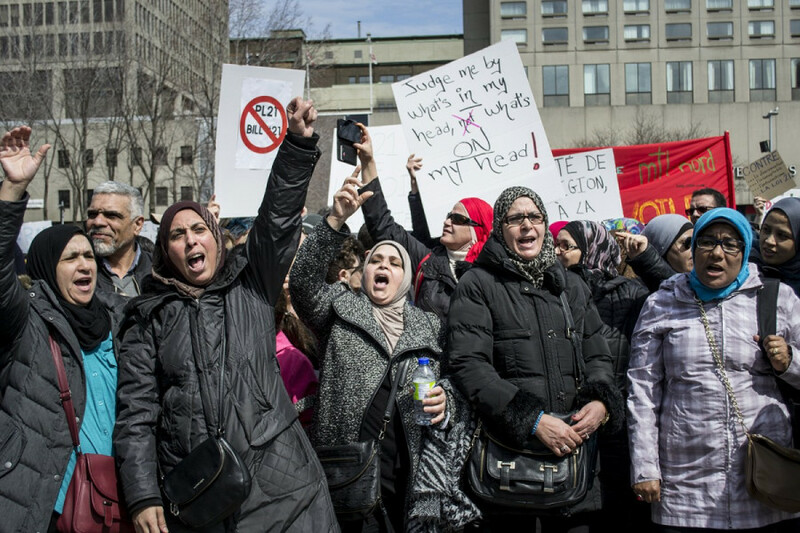 “They want to put in place a law that legitimizes the oppression of veiled women,” said Aymen Derbali, a survivor of the 2017 Quebec City mosque attack. 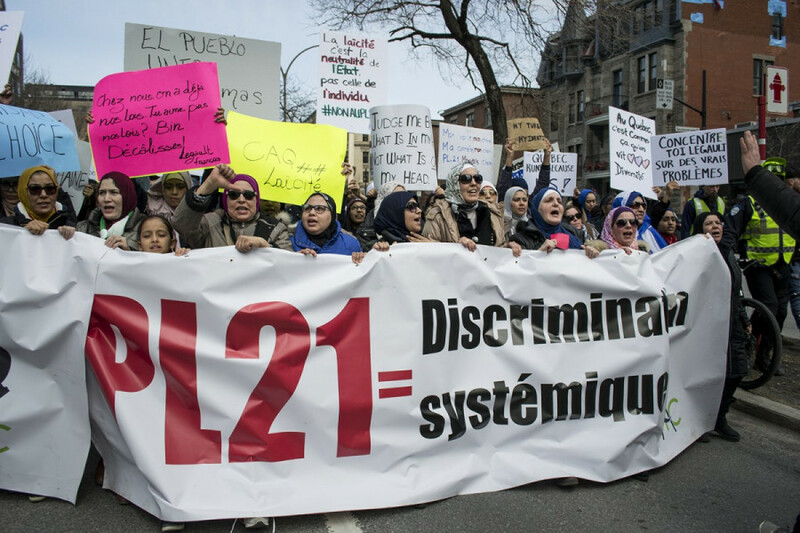 School boards, co-author of Quebec’s 2008 report on reasonable accommodation, Charles Taylor, and Montreal mayor Valerie Plante, have openly opposed Bill 21, saying it will send a negative message to newcomers and minorities in the province. Plante also argued the bill would fail to settle the debate on secularism in Quebec, a sentiment echoed by Taylor and other politicians like Québec solidaire’s Manon Masse, who considers herself the “official opposition” to the bill. “It is a legitimate tool that’s already been used by Rene Levesque and Robert Bourassa,” he said, referring to Levesque’s Charter of the French Language and Bourassa passing a law requiring commercial signs to be in French only. Since proposing the bill, Legault has been open about using Canada’s notwithstanding clause to help pass it. 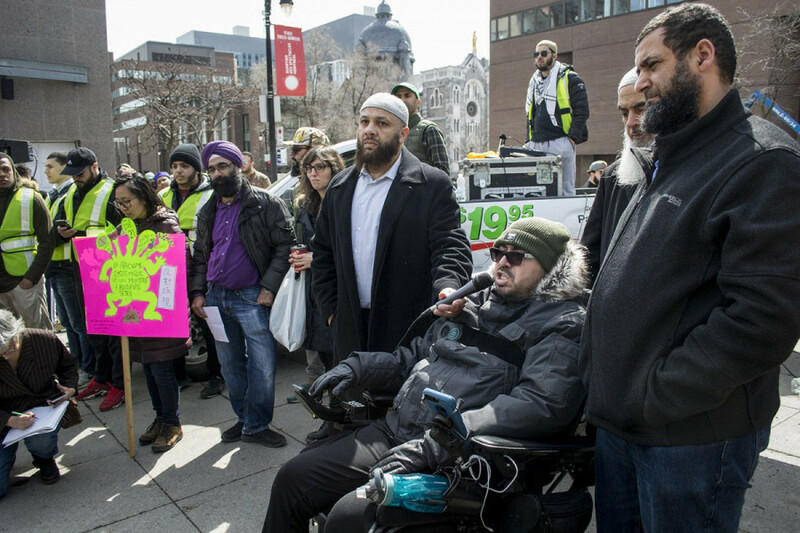 The clause, which became part of Canada’s constitution in 1982, can be used to revoke the Canadian Charter of Rights and Freedoms, which would potentially limit religious minorities from challenging the bill. Salam Elmenyawi, President of Muslim Council of Montreal, said he came to Quebec about 50 years ago thinking it’s a place of opportunity. “[Legault] is willing to discriminate against us, using the notwithstanding clause completely contrary to the spirit of our constitution,” said Elmenyawi. Legault was advised by the Canadian Bar Association last Thursday to remove the use of the notwithstanding clause, and to allow the court to make the final decision. Another protest is scheduled for April 12 in front of the Ministry of Immigration, Diversity, and Inclusion.